This pleasant traverse in alpland is about 6 miles and can be done in a short day. On the SE end this traverse an be linked with either SH1 (Gladys Divide to Lake of the Angels) or SH3 (Upper Lena Lake to Lake of the Angels). See the published Climbers Guide for detailed approach information. It is an easy walk down to Hagen Lake from this saddle, then contour WNW in heather and fir to the basin at the head of Crazy Creek. An easy ascent can then be made from the basin to the ridge crest South of Mount Hopper. (You can also reach this point directly from "the Great Stone Arrow" by following the ridge NW.) From this point, a way trail leads to the Skokomish River trail at First Divide. 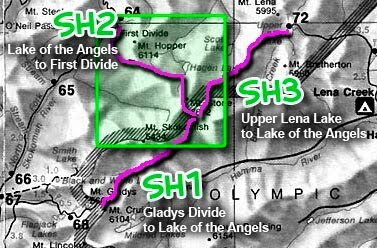 Correction from the Climbers Guide: The Olympic National Park boundary now passes to the east of Mount Stone and thus no longer crosses through "The Great Stone Arrow".